Due to the wild weather we have been having I have been staying home as much as possible. The main reason is I love my little car and trees are being blown down and ripped apart all over town. Our houseboat marina is a mess and the jetty has been torn apart. My car has been hit by small flying debris on the journeys I haven't been able to avoid, like going to work or buying food, and the risk is too great. My car is 20 years old so I can't just go out and replace it. The benefits of staying home means I get to do some sewing. I have been making a doll and is turning out cuter than expected. I just have the clothes to make and then she will be ready to show. I have been making a bit of patchwork from a book I purchased called "Playful Patchwork" by Suzuko Koseki. It has turned into a "completely done by hand" project so will be a slow on going project. I may show photos as I go along or else you will never see it! ha ha. I have made some Pot Pinchers for me and I love them. They were a necessity after taking a saucepan over to my daughters for a cooking lesson and her stove made the handle hot. As you can probably see, the pattern is from a magazine called "Making" (issue 20). The part I like the most about these pot pinchers is the fact that you only need your fabric scraps and the scraps of insulbright leftover from making oven mitts and casserole carriers. I like the charging station pictured also so will make one of those as soon as I find a suitable plastic container to cut up. There is also an awesome messenger bag pattern in the magazine that has been put on my 'to do' list. That list is getting pretty long! NOTE: I am getting rather slack/forgetful and forgot to add the link to the tutorial I used for my kitchen towel in the previous post. It is here as well as added to previous post. Also I am going to update my blog with a makeover. Change the layout etc. If anyone has any ideas/suggestions on how to improve it or advice on what not to do, I would be extremely grateful. I have read the patchwork book. It's a lot of handwork. And since you've asked, I've always found the blue wallpaper distracting. Wow I love these pot pinchers. 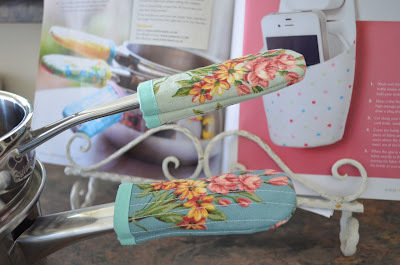 Those pot pinchers are beautiful....what lovely fabric. The pot pinchers are so cute and so functional. I didn't know that's what they were called but I need some, especially for my cast iron skillet. Take care , and lots of hugs. Those pot pinchers are a good idea..I've never seen them before! Very pretty. love those pot pinchers! great idea!